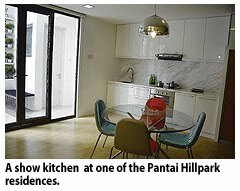 YTL Land & Development Bhd expects 50 per cent occupancy by year-end for its newly-completed Centrio development in the highly popular Pantai Hillpark address. "We handed over the keys on July 7 and we expect to achieve 50 per cent occupancy by year-end and 100 per cent by the first half of next year," its customer relations manager, Karen Tan, told a media briefing after a tour of the Centrio in Kuala Lumpur yesterday. Centrio is a low-rise mixed commercial development located at Pantai Hillpark in Bukit Kerinchi.It was launched in December 2006 and completed early this year. The development comprises 306 units of small office/home office (SOHO), boutique offices, boutique garden offices and retail stores on 1.52 ha in Bukit Kerinchi. With a gross development value of RM100 million, Centrio is developed by Syarikat Kemajuan Perumahan Negara Sdn Bhd, a wholly-owned subsidiary of YTL Land. Tan said the value of the property has almost doubled since its debut in 2006. "The launch price for Centrio was RM280 per sq ft and RM350 per sq ft for the SOHO suites and boutique offices respectively, and in just over three years, they are currently valued at RM600 per sq ft," she said. The rental rates for the SOHO suites and offices are between RM3 and RM3.50 per sq ft, she said. The Sabah Economic Development Corporation (SEDCO) proposes to build a RM30 million holiday resort in Semporna, Sabah's east coast. Chairman Datuk Mohd Ariffin Arif said the project to be undertaken by SEDCO subsidiary, Sabah Urban Development Corporation Sdn Bhd (SUDC), was currently studying the resort's layout plan. "We want the layout plan for the one-storey resort to be unique and creative, from an aerial view the resort will look like "lepa-lepa" (a type of canoe made by hollowing a tree trunk). “The new resort will provide the impetus for tourism development in Sabah, particularly the tourism sector in Semporna,” he told reporters after opening a property exhibition hosted by Sabah Urban Development Corporation. Mohd Ariffin said since SUDC was set up 38 years ago, it had helped the state government implement development projects state-wide, including building shophouses, to help uplift the socio-economic status of Bumiputeras via property ownership at competitive prices. He said SUDC was also building Darvel Bay Plaza, the biggest shopping mall in Lahad Datu, costing about RM40 million. Earlier, in his speech, Mohd Ariffin hoped the property exhibition would help SUDC reach out to more buyers and to the people to know SEDCO's roles and contributions through SUDC. “I hope this exhibition will have a positive impact on property buyers and local economic development," he said. The state government through SEDCO was determined to ensure that the people tasted development via provision of industrial and commercial areas and housing and tourism projects. KUALA LUMPUR: Nagamas International Bhd’s wholly-owned unit Nagamas Enterprise (HK) Ltd has signed a memorandum of understanding (MoU) with the government of Yongzhou City to undertake China’s Yongzhou International Multi-Trade Project. Nagamas said in a filing with Bursa Malaysia the project comprised an airport, along with administrative and management, residential, green belt, commercial, leisure, entertainment and industrial zones. The project entails planning and investing in a piece of land situated in the surrounding 50km area of Lingling Airport in Yongzhou and Chaisze town. Nagamas will act as a master planner and be involved in project and property management and become its exclusive marketing agent.